O God, who made the Mother of your Son to be our Mother and our Queen, graciously grant that, sustained by her intercession, we may attain in the heavenly Kingdom the glory promised to your children. Through our Lord Jesus Christ, your Son, who lives and reigns with you in the unity of the Holy Spirit, one God, for ever and ever. The faithful, under the guidance of an unerring Catholic instinct, have ever recognized the queenly dignity of the Mother of "The King of kings and Lord of lords": the Fathers, the Doctors of the Church, Popes, down through the centuries, have given authoritative expression to this truth and the crowning testimony to this common belief is to be found clearly expressed in the wonders of art and in the profound teaching of the liturgy. In their turn theologians have shown the fitting nature of this title of Queen as applied to the Mother of God, since she was so closely associated with the redemptive work of her Son and is the Mediatrix of all graces. Pius XII, by his encyclical letter of October 11, 1954, granted the unanimous desire of the faithful and their pastors and instituted the feast of the Queenship of Mary, giving sanction thus to a devotion that was already paid by the faithful throughout the world to the sovereign Mother of heaven and earth. According to the 1962 Missal of St. John XXIII the Extraordinary Form of the Roman Rite, today is the feast of the Immaculate Heart of the Blessed Virgin Mary which is celebrated in the Ordinary Rite on the Saturday following the Second Sunday after Pentecost. It is also the commemoration of Sts. Timothy, Hippolytus and Symphorian. St. Timothy is a Roman martyr put to death in 303 or 306 during the last persecution. His body lies at St. Paul's-Outside-the-Walls, near that of the great Apostle. The history of St. Hippolytus, martyred at Ostia, near Rome, remains extremely obscure; it is probably in error that he is called bishop of Porto. St. Symphorian was a martyr of Autun, put to death while still a young man in the second or third century. He is one of the great saints of Gaul and several churches were built in his honor. His Acts appear to be genuine. With the certainty of faith we know that Jesus Christ is king in the full, literal, and absolute sense of the word; for He is true God and man. This does not, however, prevent Mary from sharing His royal prerogatives, though in a limited and analogous manner; for she was the Mother of Christ, and Christ is God; and she shared in the work of the divine Redeemer, in His struggles against enemies and in the triumph He won over them all. From this union with Christ the King she assuredly obtains so eminent a status that she stands high above all created things; and upon this same union with Christ is based that royal privilege enabling her to distribute the treasures of the kingdom of the divine Redeemer. And lastly, this same union with Christ is the fountain of the inexhaustible efficacy of her motherly intercession in the presence of the Son and of the Father. Without doubt, then, does our holy Virgin possess a dignity that far transcends all other creatures. In the eyes of her Son she takes precedence over everyone else. In order to help us understand the preeminence that the Mother of God enjoys over all creation, it would help to remember that from the first moment of her conception the holy Virgin was filled with such a plenitude of grace as to surpass the graces enhancing all the saints. Recall what our predecessor Pius IX, of blessed memory, wrote in his Bull Ineflabilis Deus: "More than all the angels and all the saints has God ineffable freely endowed Mary with the fullness of the heavenly gifts that abound in the divine treasury; and she, preserving herself ever immaculately clean from the slightest taint of sin, attained a fullness of innocence and holiness so great as to be unthinkable apart from God Himself, a fullness that no one other than God will ever possess." Spurred on by piety and faith, may we glory in being subject to the rule of the Virgin Mother of God; she bears the royal sceptre in her hand, while her heart is ever aflame with motherlove. 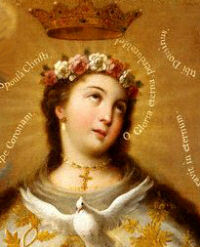 From the MOST Theological Collection read the Queenship of Mary. During the pontificate of Pope Melchiades (311-314), Timothy of Antioch came to Rome and preached the Gospel. The prefect of the city, Tarquin, placed him under arrest and after a period of imprisonment ordered that he be scourged three times because he refused to sacrifice to the gods. After further excruciating torments Timothy was beheaded. At Ostia, the bishop, St. Hippolytus, was a man of exceptional culture. Because he was an outstanding witness to the faith, he was bound hand and foot by Emperor Alexander and cast into a deep pit filled with water; thereby he obtained the crown. Not far away Christians buried his body. At Autun the youthful Symphorian was brought to judgment under Emperor Aurelian (270-275). His mother urged perseverance: "My son, think of eternal life. Raise your glance to heaven and behold your eternal King! Your life will not be taken from you, but transformed into a better one!" Read this reflection on St. Symphorian.